Hygienic cleanser & sanitiser dispenser whose stainless steel finish is contemporary enough for any office or public restroom. Viewing window allows you to keep track of soap levels. For use with Kleenex & KimCare cartridges. 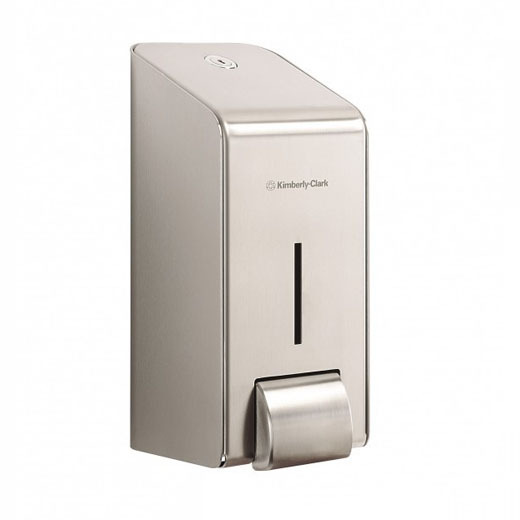 The essential hand cleanser dispenser for any business. Compatible with a range of washroom products, this dispenser promotes hygiene and helps to manage costs through controlled dispensing. The sleek and contemporary design makes it the perfect product for any washroom environment. The dispenser is made with rounded edges and is easy to clean with just one cloth or wiper. The rounded top prevents an accumulation of rubbish, dust and dirt. This product is part of our co-ordinated range of products to give your washroom a stylish and professional feel.